When I was thinking about writing a blog on a street food walk around London the first thing I asked myself was, ‘where I would start, and where would I finish?’ I know this is supposed to be a street walk but coming from the East End my starting point had to be G Kelly’s Pie and Mash Shop on Roman Road. G Kelly is the original pie and mash shop situated in the heart of the East End. There are only two choices in a pie and mash shop, either pie or eels? The famous liquor is made from the eel’s cooking juices with loads of parsley added and thickened with potato flour. The pies are made from shortcrust pastry, filled with minced beef. The mash is nothing fancy but it has to be topped with the green liquor and a splash of chilli vinegar, it is magic on a plate! 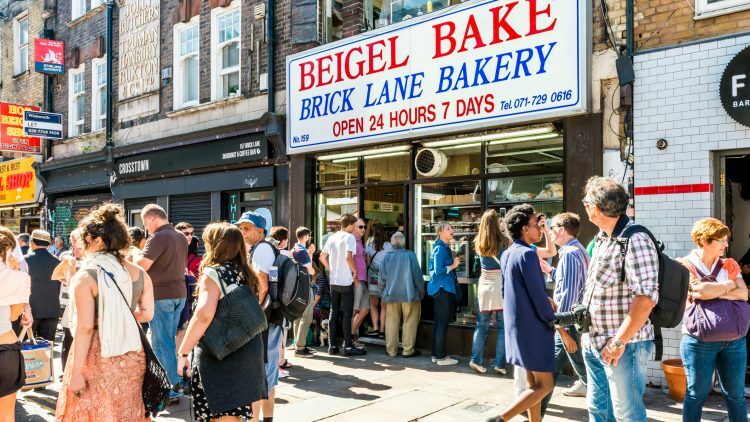 Take a short train ride to Beigel Bake, situated in Brick Lane. It is open 24 hours a day, so you can grab a bagel anytime of the day. All the bagels and salt beef are baked on site and served simply with a generous amount of mustard and a dill pickle, maybe this is the original street food?? A short walk away in the heart of Shoreditch is Smokestak; this is the best restaurant I have visited so far in 2017. Serving a selection of home-smoked meats which are cooked in a giant smoker situated in the middle of the restaurant, or maybe some pork ribs cooked on the Argentinean grill. For me one of the highlights is the beef rib with the pickled chilli, delicious. They offer small plates, so you can eat your way through the whole menu! My only advice is that you don’t eat here before a night out because your clothes will smell of smoke. Personally I would bottle the smell and splash it all over! Still in Shoreditch, is Dishoom. Now I know there are a few of these in London but without doubt they do one of the best breakfasts in town. I have never eaten lunch or dinner here, but the fried egg and crispy bacon naan, with spiced masala beans, is a must. All washed down with a chai, what a great start to the day. After a short train ride to Chinatown the next place was shown to me by a friend. It isn’t a restaurant, but located in Dansey Place, a small backstreet in Soho, is Lo’s Noodle Shop. Through a small entrance is a tiny noodle factory that makes fresh noodles every day. They make loads of different types that you pay for by the bag, at a mind blowing £1 per bag! We bought a bag of fresh ho fun noodles dusted with chilli flakes. Then pop round the corner to one of the Chinese supermarkets to buy some shiitake, bok choy and some fresh black beans. Then back home to cook up a tasty meal for next to nothing. Keep going on the Street Food walk round the corner to Palomar in Rupert Street. This restaurant calls itself modern Jerusalem. I love to sit at the bar and eat, because from here you can see the kitchen in full flow. I love the Kubaneh bread that is baked in a traditional Yemeni pot accompanied with Harrisa, burnt aubergine and pickled shifkeh peppers. You can choose from a great choice of delicious meats and fish cooked on the Josper or Plancha. To be honest the food in here is great, you won’t be disappointed with whatever you choose. One thing I would definitely recommend is the cocktails. When I was there the barman made a drink of vodka, fresh ginger and lager! Yes, lager, after quite a few samplers I can confirm that it was lovely, refreshing and very alcoholic. Just around the corner in Denmark Street is the Smoking Goat. The menu is Thai influenced and is predominantly focused on smoking and slow cooking. There are some staple items on the menu that never change like the fish sauce, chicken wings and the grilled scallops in a Red Nam Yum Sauce. Both are a must-have, they also do larger dishes to share, like the smoked goat shoulder with sweet soy and the lamb ribs with the gapi glaze. Both are amazing. All dishes come with a spicy som tam salad and sticky rice. A short walk to Windmill Street and you’ll find Blacklock. This restaurant is in the basement and is built on the site of an old brothel! I first visited here when it had just opened and they only served chops pork, lamb or beef. They have now developed the menu and do a lot more specials. The meat is cooked on a large charcoal grill that is lit first thing in the morning; they also place heavy irons into the coals to get them red hot. When they cook the meat they place it onto the grill and then the iron directly on top, this creates a great sear and crust to the meat and cooks it in minutes. I would recommend ordering the sides. They put sweet potatoes in the coals at the end of the night then roast them the next day, delicious. The kale caesar salad and grilled baby gems are also winners. I also hear that Sunday lunch is amazing and customers are queuing out the door. Now my last stop on the street food walk is a bit of a trek but along the way we can pass Kingly Court, which has loads of different restaurants. Kingly Court is hidden away in between Carnaby Street and Regent Street. There are loads of good places to eat here, Pizza Pilgrims, Rum Kitchen, Senor Ceviche, Dirty Bones and many more. I would recommend trying Island Poke and JinJuu. Island Poke sells bowls of traditional Hawaiian raw fish and rice that you can build yourself choosing your own dressing and toppings. If you like sushi you will love this. JinJuu is a great Korean restaurant that is owned by Judy Joo, who is famous for being on Iron Chef in the US. I love the bibimbap in here served in large stone bowl with a crispy fried egg on top. Don’t miss the Korean fried chicken; it is one of the best you will ever taste. My final stop on my street food walk is not a restaurant but a bar; take a long walk up to Park Lane to the Dorchester Hotel. I know this is a bit extravagant but I love sitting in the promenade bar with a drink in my hand listening to the piano player entertaining everyone having afternoon tea and watching the world go by. The Dorchester is such a beautiful hotel and full of very rich people, but I just love the extravagance and atmosphere. I know this is a long way from the starting point of the street walk, but it is well worth it.